The 2018 Richmond Folk Feast sold out in a record 18 hours! Thank you to all who came out to support the Richmond Folk Festival. 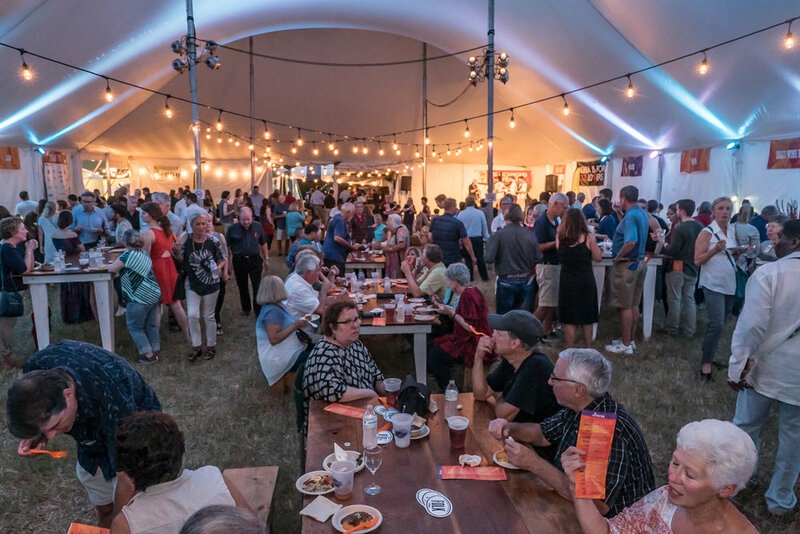 Tickets for the 2019 Feast will go on sale in the Summer of 2019. 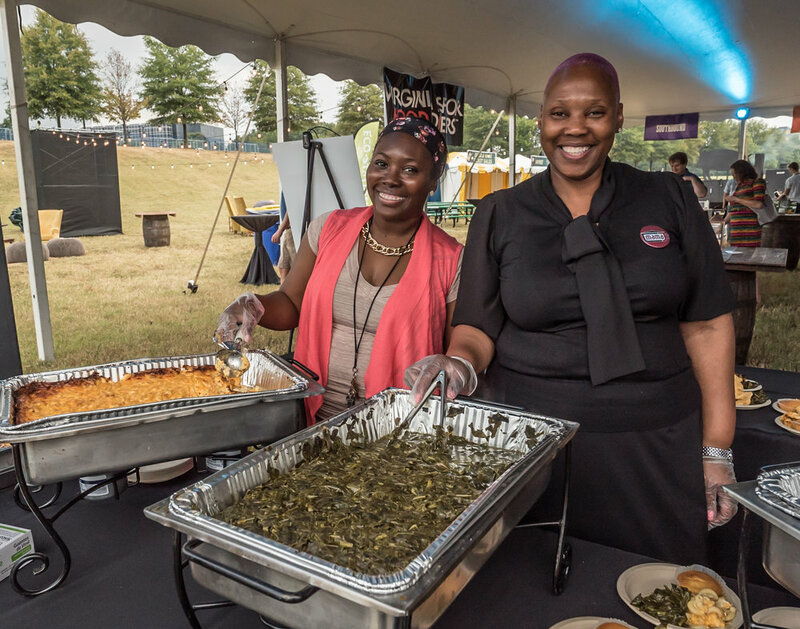 The Richmond Folk Feast started 6 years ago, when the chefs of Richmond, VA wanted to help support the Richmond Folk Festival. On the Tuesday before the festival, the brightest stars of Richmond's restaurant community gather at Upper Tredegar to raise funds by presenting signature dishes and showcasing our city's rich and diverse dining scene. 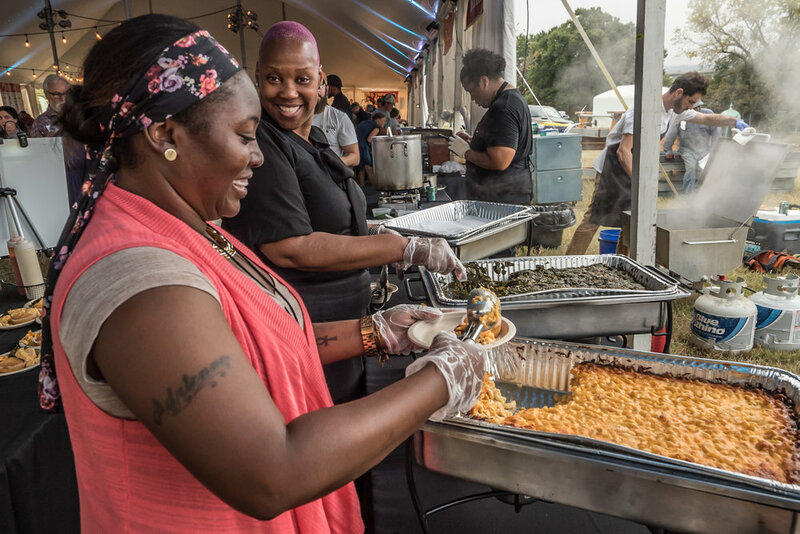 This is an exclusive chance to experience the best eats our city has to offer, meet the chefs shaping our culinary landscape and support Virginia's largest, most culturally dynamic festival, all under one tent. Ticket sales benefit the Richmond Folk Festival. Wine provided by Tap 26. Beer provided by Champion Brewing. As a special thank you, take advantage of complimentary parking for the entire festival weekend, and a unique pin that will exempt you from the bucket brigade's donation requests. An additional thanks to Williams Mullen for their continued support of the Richmond Folk Feast! When not creating delicious Southern specialties at his restaurants in Richmond, (Comfort, Flora and Pasture), Jason is spending time with his family. The Pulaski, VA, native plays drums in a couple of raucous party bands and has a pair of Ramones Vans. Hey! Ho! Let's Go! Trained professionally as a chef at the French Culinary Institute in New York City under Master Chefs Jacques Pepin, Andre Soltner and Alain Sailhac, Brittanny has worked for 15 years in the restaurant industry. 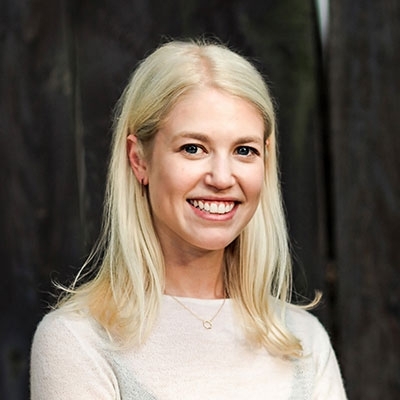 After graduating at the top of her class at FCI, Brittanny worked in some of the best kitchens in New York City, most notably Blue Hill at Stone Barns and Northern Spy Food Company. 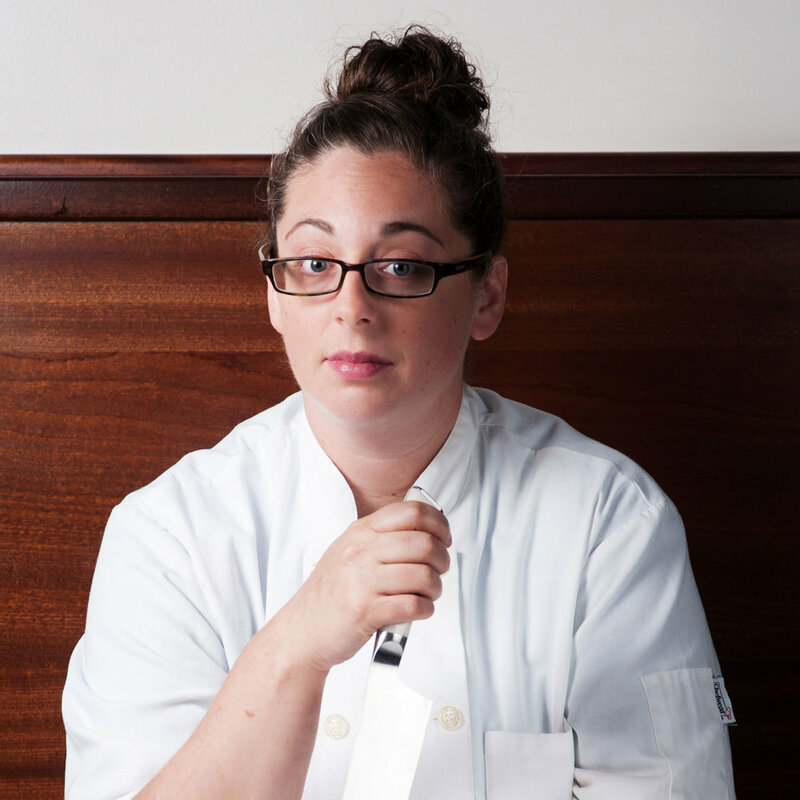 Brittanny now cooks modern, seasonal, German-influenced cuisine as the Executive Chef and co-owner of Metzger Bar and Butchery in Union Hill and Brenner Pass in Scott’s Addition. Following her graduation from the Professional Pastry Arts Program at the French Culinary Institute in New York City, Morgan returned to her home state of Virginia to work as an assistant pastry chef at the Jefferson Hotel. With her blend of classic French technique with familiar American flavors, she then gained a loyal following selling croissants and pastries at Richmond farmers markets, ultimately providing the momentum and support she needed to open her first retail bakery, Whisk, in 2015. In 2018, she opened Scoop, a small-batch ice cream shop in the Fan neighborhood of Richmond. Chris Brooks was born and raised in Richmond, learning traditional cooking through the women in his family: mother, aunts, and grandmas, who have a shared knack for combining the right ingredients. His earliest cooking memories are of these women preparing meals. “In the South, dinners would be done big, on Sundays, usually at your grandmother's house,” Chris recalls. “My interest came from the smells, the noise... and then I had to be active and learn to crack eggs, run a mixer, and be able to feed myself.” For the past 15 years, Chris has been employed by Croaker's Spot in Richmond. A family-run business that started in Richmond's historic Jackson Ward neighborhood, the restaurant prides itself on preparing seafood in the style of soul food. It is also beloved for its seafood chili, alfredos, sautéed dishes, cornbread, and of course, some of the best fried fish in town. Evan, a Virginia native, has come back down to Richmond to open ‘The Stables’ after having worked the fine dining restaurant scene in Boston and opened up the 'Trophy Room' in the South End. He received his formal training at Le Cordon Bleu and, as a result, his fare is a fresh take on Southern fare with French fine dining finesse and a touch of New England grit. His passions outside of the kitchen include wine, lazing by the river, and spending time with his partner and horde of dogs and cats. Adam Hall grew up in Albemarle County learning traditional Southern foodways from his mom. He’s been cooking in Richmond since 2003 and traveled extensively through Central America and the Caribbean to develop his Southern, Afro-Caribbean, and Latin American vision for his restaurant, Saison. He loves old Country music, has a big dog, is looking for an old truck, and is slowly turning into a redneck. Velma "Mama J" Johnson was born and raised in Richmond. One of 14 children, she learned to cook by helping her mother in the kitchen. Mama J spent 17 years as a deputy sheriff, catering on the side. In 1999 she started catering full time and Mama J's was born. Mama J cooks the same dishes her mother made, traditional Southern comfort food with an emphasis on family. When she's cooking on the line, she prefers gospel, soulful 60's R&B or anything "good feeling". 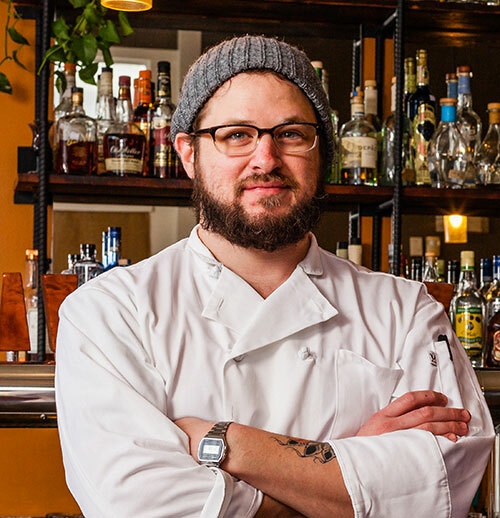 A native of Danville, Virginia, Elby's Rising Star nominee Scott Lewis worked with Chef Lee Gregory at Six Burner and The Roosevelt, and with Gregory and Chef Joe Sparratta at Southbound before becoming head chef at Laura Lee's in 2016. A Richmond area native, Chef Jason Lucy graduated from the Culinary Institute of America in Hyde Park New York in 2001. After graduation he returned to Richmond and began his culinary career in catering and at local restaurants. In 2014 Jason and his wife, Amanda, opened Lucy's restaurant. Award-winning Africanne food enthusiast, Chef Ida MaMusu, is a native of Monrovia, Liberia (West Africa). At the tender young age of eight (8), MaMusu created her first recipe, which consisted of flowers and plants. 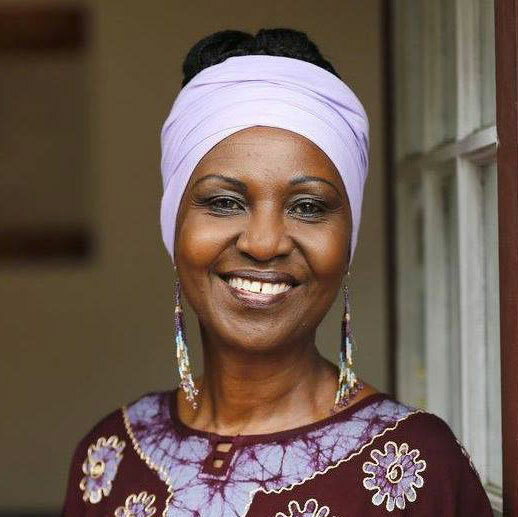 Years later, she became an apprentice under the tutelage of her maternal grandmother, whom she affectionately referred to as, “mommie.” With encouragement from her grandmother, MaMusu turned her culinary talents into a profitable business in the U.S. She now owns her own restaurant, Africanne On Main, in Richmond, VA, where she provides fresh, healthy, all-natural meals daily. Laine opened Graffiato in 2014 as a sous until late 2016, then joined Metzger Bar and Butchery. She was proud to win this year’s Broad Appetit “Iron Chef” competition. Laine's inspiration from childhood was her German grandmother, who never let anyone go hungry and cooked meals around the clock including brisket with spaetzle, cow tongue, and gingerbread, among other things. Her cooking style stems from cuisines emphasizing bold Mediterranean/Caspian and Western European flavors. In her free time, Laine enjoys hiking with her mom, playing guitar, and is completely obsessed with her 7.5 pound sweet angel dachshund/chihuahua, ZsaZsa. O'MY launched this summer in local Richmondgrocers and quickly expanded through the Mid-Atlantic to New England. 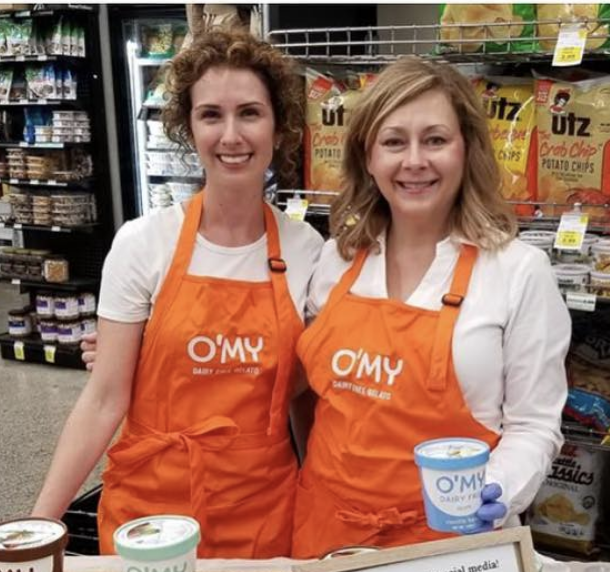 CEO and Co-founder Allison Monette had a vision for a creamy, delicious dairy-free frozen treat that more people could enjoy together, and COO and Co-founder Julie Bishop brought that vision to life. Together they developed recipes for six gelato flavors that stayed true to their commitment to create an offering that’s creamy and indulgent, simply made, and allergen-aware. Virginia native, Craig Perkinson got his start cooking alongside his Mom and Grandma in rural Chesterfield County outside of Richmond. He describes his style as seafood-focused, comfort food with a technical twist that sometimes reflects his time in New Orleans. 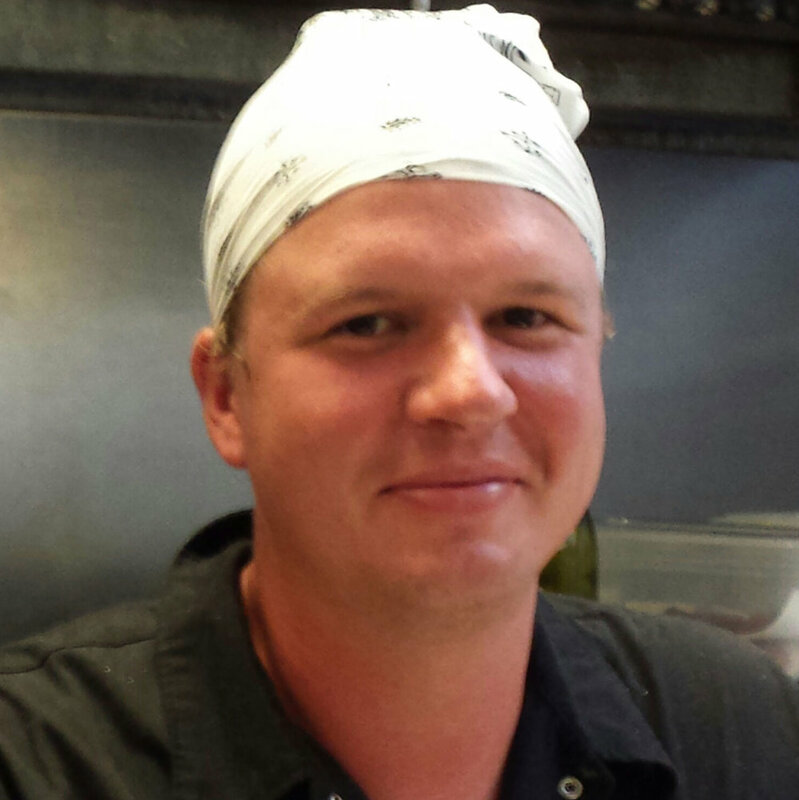 After a stint in New Orleans, Craig returned to Richmond as Sous Chef at Pescado’s and eventually to Heritage as Sous Chef. Now as Chef de Cuisine at Southbound, he’s helped them to garner attention at Bon Appetit, Southern Living, Conde Nast Traveler and The Manual. For Chef Caleb Shriver, food has always been a means of gathering, a way to bring family and friends together. An Oklahoma native, Shriver has fond memories of his mother's southwest cooking comfort foods often comprised of family caught and hunted fish and game. Growing up he often helped out in the kitchen, and it wasn't long before a fascination with food began to form. After stints in Oklahoma City and Chicago, Shriver moved south to Richmond and began working at Aziza's in 2010, garnering multiple local awards. Now celebrating its five-year anniversary of Dutch & Company, Chef/Owner Caleb Shriver and his wife, Michelle, continue to cultivate relationships with local farmers to offer seasonal, regional items that highlight Virginia products. A native of the garden state of New Jersey, Joe was born into a family of chefs, and took up the craft at an early age. It was not until he began working at The Ryland Inn, under Chef Craig Shelton, that he truly found his passion. 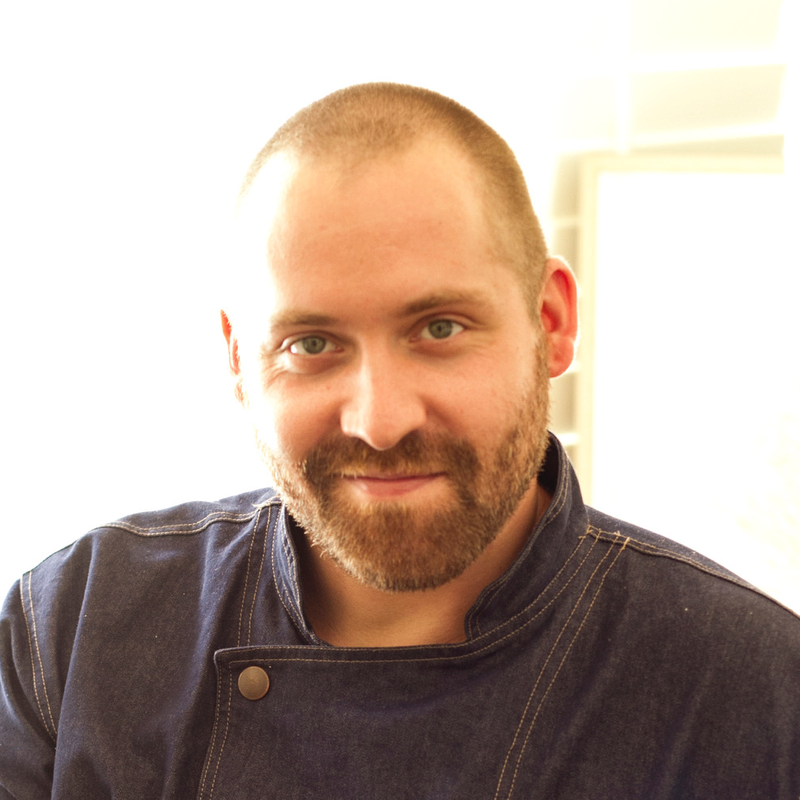 Since moving to Virginia, Joe has worked with restaurateur Paul Keevil, and also with Chef Jason Alley, Michele Jones, and Ry Marchant at Pasture, followed by the launch of his own restaurant, Heritage. Since its opening, Heritage has garnered numerous accolades including Chef & Restaurant of the Year Elby's in 2015. In his latest project, Sparatta has teamed up with Lee Gregory of The Roosevelt, and local Richmond farmer Matt Gottwald to open the upscale casual eatery, Southbound. Southbound was listed by Bon Appetit as one of “America’s Best new Restaurants 2015”, and received the 2016 “Best New Restaurant” Elby award. Venture Richmond Events, LLC produces the Richmond Folk Festival. Venture Richmond Events is a 501(c)(3) non-profit organization. The amount of the contribution that is deductible for federal income tax purposes is limited to the excess of any money (and the value of any property other than money) contributed by the donor over the fair market value of goods or services provided. $80 of each regular priced $100 ticket purchase is deductible as a charitable contribution.